El albergue Las Peñas de Nájera es un albergue privado para peregrinos del Camino de Santiago, y también para turistas, que se encuentra la parte antigua de la villa de Nájera, en un antiguo edificio tradicional totalmente renovado por dentro y por fuera. El albergue de peregrinos, La Judería - Sancho III, cuenta con un restaurante bodegón que ofrece menú a 10 € y platos a la carta a 15 €. Located in the historic heart of Nájera, surrounded by the murmuring river and with an extensive riverbank garden for the delight and tranquility of the pilgrim, Albergue Puerta de Nájera is a benchmark building on St James' Way through Nájera. Classical architecture, renovated at the end of the past century and beginnings of this 2012, it offers you all the services and comforts you need to regain strength and enjoy a well-deserved rest helping you to face the next stage of The Way. 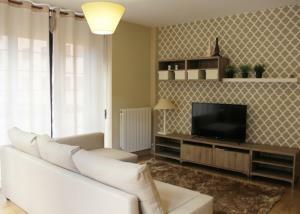 Haz un alto en tu camino y disfruta de nuestros modernos apartamentos, con un equipamiento inmejorable. Vive una experiencia única y disfruta de la cultura, la historia y la gastronomía de La Rioja. At an altitude of 485 m on the banks of Najerilla River, in the Valley of the same name. Cradle of Kings and hub of the region. The Monastery of Santa María La Real is the area's main artistic jewel, in the heart of St James' Way. Located in a former Bullring. High season: from 1 April to 10 September. Our rooms have an excellent view, in addition to their great comfort. Come and see for yourself. 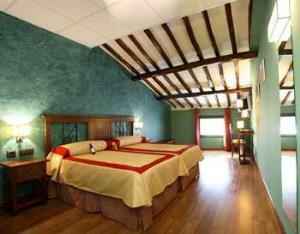 Special weekend rate (long weekends/bank holidays): Double room 50 euros, VAT included. The idea is the result of a personal and professional wish to turn a charming space into another one even more attractive and inviting to enjoy a city steeped in history. It is located in the vicinity of the left bank of the Najerilla River, in the old town, in a 17th century building completely renovated and restored with great taste and care, to become a hotel with all the comforts. 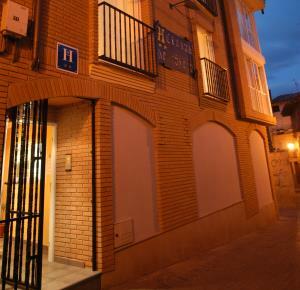 Hotel Duques de Nájera has 15 spacious rooms with full bathroom shower/bathtub, careful decoration and special atmosphere. It also has air conditioning, heating, telephone, fax, Internet, safe, alarm clock, soundproofed rooms.Rooms adapted for disabled and non smoking adapted for disabled guests and non smoking guests available. 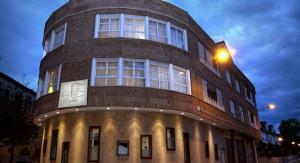 Facilities: TV Lounge, garage, room service, bar and breakfast room. 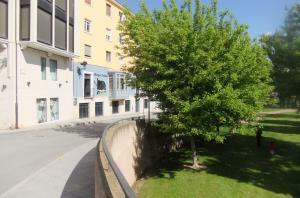 Location: in the Centre of the city, 25 km from the train station and 35 km from the airport. Come and stay at PENSIÓN CALLE MAYOR IN NÁJERA where you'll receive personalized attention and will be able to contact your family by Internet, send them your photos and regain your strength to continue your journey.